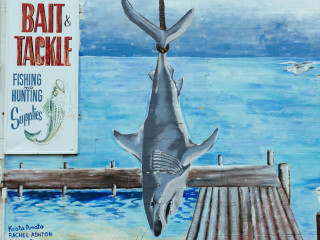 BAIT & TACKLE embodies the ethereal, gritty, and nautical vibe that is the bedrock ofMastic Beach, James’s hometown. The story follows Katherine, a widow in the twilight years of her life. She battles stress-induced hallucinations, churning up years ofresentment as her new eccentric roommate, Wanda, seeks retirement and redemption.Both tales come to a head when her estranged daughter comes calling on her doorstep. The initial concept was inspired by the strong women who raised James and through a dark comedic lens, the film aims to explore the relationships between children andparents. What does it mean to be loved? BAIT & TACKLE is a fresh, multigenerational narrative that draws inspiration from the 70s new wave (with a nod to the Neo-realists), both in its attention to rich character drama and distinct aesthetic. In addition to a solid base of studio film and TV credits, AMY GAIPA’s first love of independent and developmental projects includes the character Lady in Good Grief, feature films Silver Tongues and La Vida Inesperada, Trudy Bolt in TITANIC, the Sloane readings at the Tribeca Film Festival, Sam in Show Pony and a plethora of roles with New York Madness, and most recently Meredith in The Visiting Hours off-off Broadway. A summer stint with Steppenwolf Theatre Company, which included Puck in A Midsummer Night’s Dream, seemed to usher in this very productive artistic period. Amy is thrilled to be a directing MFA Film candidate with SBU/Killer Films as well as serving as a Production Designer and Producer on multiple projects. Amy teaches film at SBU and is a member of NYWIFT, New York Women In Film & Television.